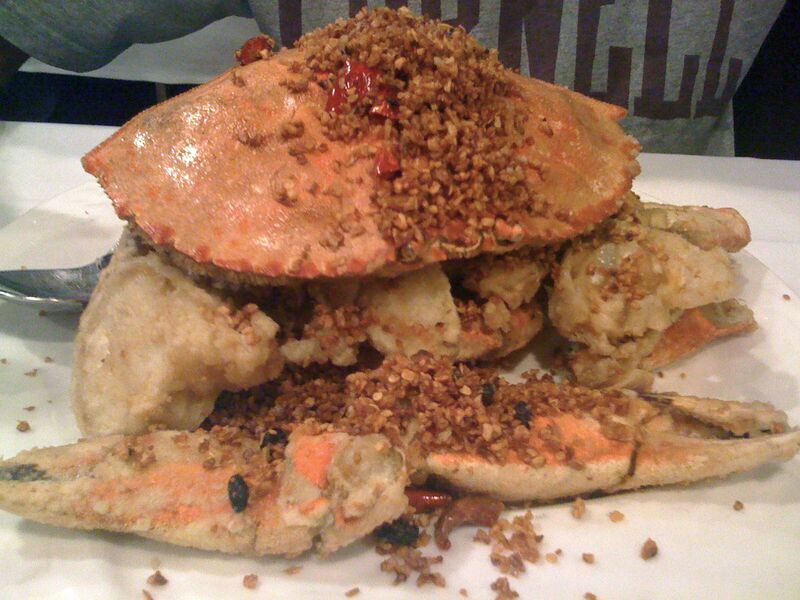 After several weeks of lusting after the salt and pepper crab, my boyfriend got his wish Monday night as we ventured over to China Town for dinner at R & G Lounge. We’d ordered takeaway from R & G several times before and, while I found the food good, I didn’t think it dramatically different from any other Chinese restaurant. After dining in-house at what many consider to be the holy grail of San Francisco’s Chinese food, I ended up changing my mind. For starters, R & G wasn’t the cramped, colourful Chinese food shop I had pictured it as in my mind. Instead we were greeted by a large, modern space, three-tiered, high-ceilinged and brightly decorated in glass and steel. People dress up to go to R & G and the short skirted, high-heeled Asian girls who walked in left me feeling uncharacteristically underdressed for SF in my jeans and hoodie. While modern and high-end, the upstairs seating area feels distinctly Chinese, with traditional decorations and an entirely Asian staff. We managed to snag the last table before the dinner crowd tumbled in and a waiter promptly came by to ask about drinks. At first glance, R & G’s leather-bound menu could fool you for a 12-page novelette, but a closer look reveals that it’s conveniently illustrated with delicious-looking pictures of signature dishes. Having previously tried the special beef and seafood lettuce cups, we decided to go for the hot and sour soup, geoduck sashimi and scallops with steak cubes (in addition to the infamous crab, of course). The waiter was nice enough to inform us that the geoduck was trading at $60 per person (yikes! ), meriting an easy pass and, resulting in a more realistically sized order. Next Next post: Food Truck Anyone?